Dunebrook’s mission is to help parents build healthier, happier families. We have a fully trained staff that provides guidance, encouragement and education in the home. Parents learn how to build confidence and competence as they are assisted with basic family needs, learn positive interactions with their child, gaining better understanding of what to expect in their child’s growth and development and life coping skills. In addition to our positive prevention focus, we also offer intervention assistance in child abuse investigations. Interviews are conducted on site in a comfortable, child and family friendly environment. Our programs are free and totally confidential. 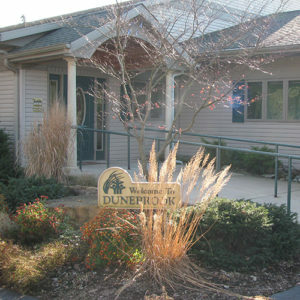 Dunebrook was founded in 1989 as a not-for-profit organization. Offices in Michigan City and Valparaiso serve six counties, La Porte, Porter, Starke, Newton Jasper and Pulaski Counties. Dunebrook’s founders continue to be passionate about helping those in both prevention and intervention. In 2015, more than 6,357 home visits were made, 6,031 children learned through out Body Safety Program, 210 Forensic Interviews were conducted, 11 Stewards of Children Presentations were conducted with 117 parents participating and 13,054 books were distributed during our home visits.